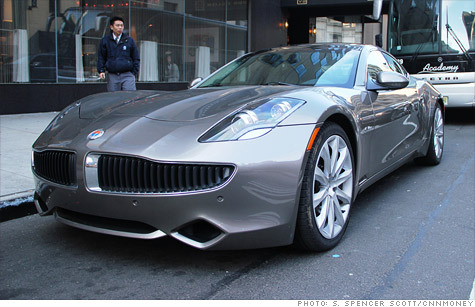 The Fisker Karma is a beautiful car, but do the company's financial problems threaten it? NEW YORK (CNNMoney) -- Fisker Automotive, the electric car company that received $528 million in Energy Department loan guarantees, announced layoffs at its Delaware production facility on Monday. The Energy Department agreed to support two Fisker electric car projects: a luxury model -- the$103,000 Karma, which is on sale now -- and a more affordable sedan, the Nina. The loans were to be paid in phases, but Fisker has missed production goals, keeping much of the federal funding out of reach for now. Fisker said it is working to renegotiate the loan agreement with the government. "We have temporarily delayed work at the plant based on ongoing discussions with the DOE regarding funding for the Project Nina program. As a result, we have laid off 26 people," the company said in a statement Monday. The Energy Department has drawn criticism in the past year when some of the startups it backed went belly up. Three companies that got loan guarantees or grants -- advanced solar panel maker Solyndra, battery-maker Ener1, and alternative energy firm Beacon Power -- have fallen into bankruptcy. Energy Department spokesman Damien LaVera said both sides continue to work together and that Fisker's problems were typical for startups. "The department is working with Fisker to review a revised business plan and determine the best path forward so the company can meet its benchmarks, produce cars and employ workers here in America," LaVera said. Fisker said it has received $193 million in loan guarantees from the government so far, mostly for its Karma program, and continues to pursue alternative funding sources. "We have successfully raised an additional $260 million of equity in late 2011, bringing the total amount of private equity financing to more than $850 million," the company said. Fisker's production facility in Delaware is a General Motors (GM, Fortune 500) plant that is being recommissioned. The plant will make Fisker's Nina sedan, but production there has yet to begin. Vice President Joe Biden, Delaware Gov. Jack Markell and Fisker CEO Henrik Fisker were together in 2009 to announce plans for the production facility. At the time, union workers were promised the chance to fill many of the 2,000 factory jobs producing the plug-in electric sedan. It was unclear Monday how many of those positions had ever been filled.